This raid has been made for snowmobile and adventure lovers. 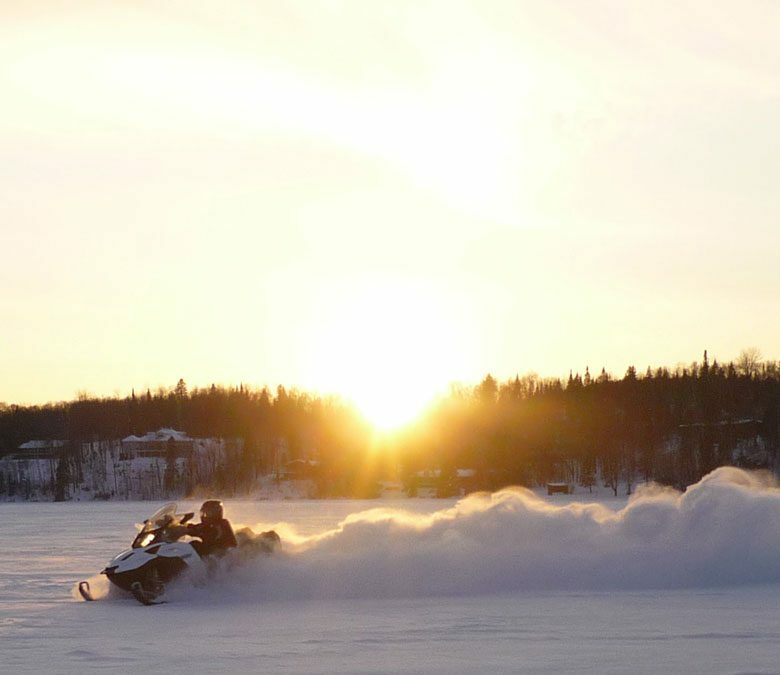 It is built upon more than 1,500 kms snowmobiling at a sustained pace. You will enjoy these stages in powder snow, evenings out, trails opening and even more surprises ! The tour detailed in this page is only an overview of what we can provide for this trip and has to be taken as an example. During such raids we have reached remote destinations like St Jean lake, the Monts Valins or Abitibi. Other groups have privileged the quality of the trails, the powder snow and off-road race over the destination. You are free to plan your own raid with your guide. As adventure is freedom above all, the itinerary and the stages remain up to you ! You will always find the magic of sliding and the pleasure to drive in unique and wild landscapes. So form your own group or join another ! This adventure has to be appreciated by experts ! After a hearty traditional Quebec breakfast , you will be given some security rules and yet you will leave for your great raid. We will head due north for six days. This day 2 you will cross Golden Gate Bridge to reach St Côme and its ice sculptures (if in the right period of the year). This stage will end in St Michel des Saints in lac Taureau’s lodge, a lovely inn on the shore of the lake. You will sleep there. In the early morning, you will ride off-road until a viewpoint on the lake and overviewing the region. Then you will continue due north to reach a very secluded outfitter. This outfitter is lost in the middle of the forest and it will marvel you with its rustic appearance and yet all the comfort you need. You will sleep in the Lac du Repos outfitter. After you spent a morning snowmobiling across breathtaking sceneries, you will have lunch in an aboriginal village of the Atikamek tribe. As you will continue sinking into woody landscapes, you will reach the outfitter of 100 lacs, your farthest north stage. You will have dinner and sleep there. This day your circuit will drive you to the club Fontbrune’s outfitter, which is all made of round wood. This outfitter is located along the Piscatosine lake, which communicates with the Baskatong reservoir, a real inner sea. You will have dinner and sleep there. This day you will ride on the Baskatong lake, a huge water basin of more than 400km². For your last stage you will then reach another breathtaking outfitter, Cécaurel. This upscale accommodation is located along the Kiamika lake You will have dinner and sleep there. You will experiment the famous crossing of Mont Tremblant park and Matawin reserve. Then you will arrive to a snowmobile relay. After lunch, you will discover the beautiful Caribou trail. At the end of the day you will be back to Entrelacs and we will drive you to Montreal. Free dinner and night downtown. This day you will discover Montreal where you will enjoy a guided tour. In the afternoon you will be free to do some shopping in the city. In the evening, you will go leave for the airport. It is a lovely inn composed of bedrooms with double or twin bed and private or shared bathroom. You will relax in front of a fireplace in the living room. Departures on Saturdays. Please contact us for another day .